Some might argue that Groupon is a dog that’s had its day, but they’d be wrong. While it’s old deal-a-day discount voucher business model failed to last the test of time, that’s only forced Groupon to rethink its strategy, and its come up with a plan that might just work. The site has revamped itself as a business listings directory similar to the Yellow Pages. Which is great news for consumers, because not only does Groupon provide them with all the business details they need, but it also helps to save them money because it’s still offering great deals on coupons for every business it lists. 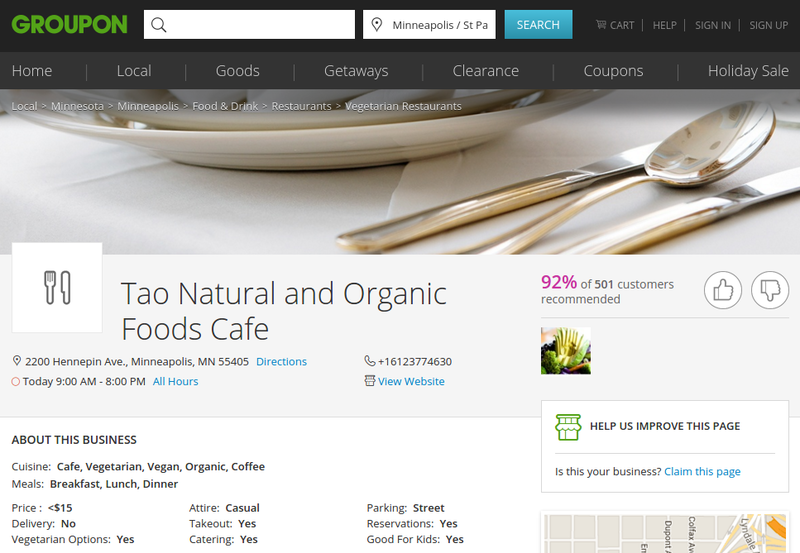 Check out the great deals with this Tao Natural and Organic Foods Cafe listing for example.